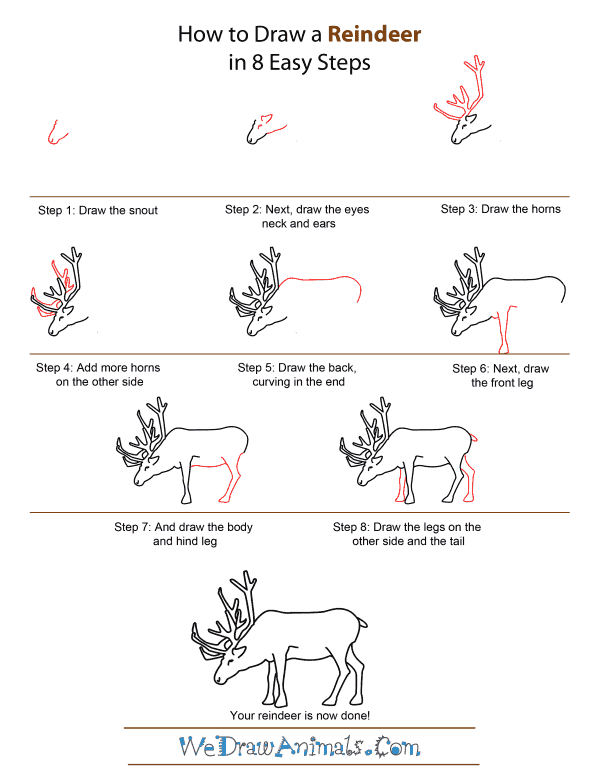 In this quick tutorial you'll learn how to draw a Reindeer in 8 easy steps - great for kids and novice artists. At the bottom you can read some interesting facts about the Reindeer. 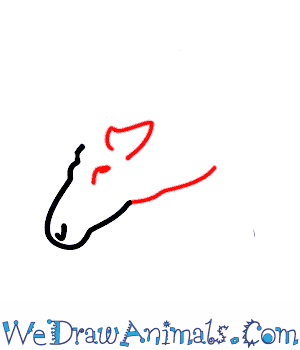 Step 1: Start by drawing the cone-shaped snout. There is a small curved line at the tip. The top part is the nose. Step 2: Continue the bottom snout line to make the neck line. Add a tiny eye at the top of the snout. Right above the eye add a triangle-shaped ear. 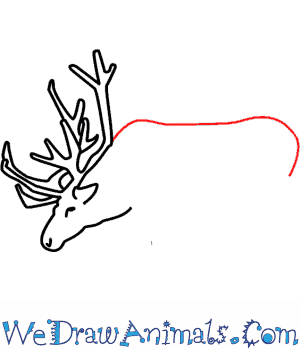 Step 3: Draw the first antler. Think of a tree branch. The bottom branch is long and slightly curved. The middle branch has three smaller branches. The top branch curves upwards with three small branches right at the top. Step 4: Add another antler on the other side. The bottom branch is short and bent. The middle branch is a bit longer and curved. The top branch has three smaller branches. 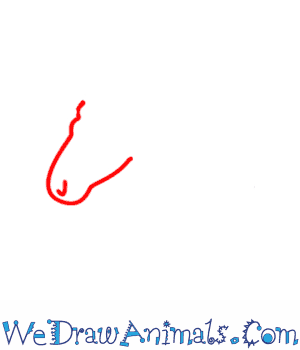 Step 5: Draw a long back line. It bends down sharply at the rump. Step 6: At the end of the neck line start drawing the long thin front leg down. There is a thick hoof at the bottom. Draw the back of the leg up to make the belly line. Step 7: Continue the belly line back from the front leg toward the hind leg. It is wider at the top than at the bottom. The back of the hind leg is angled upwards and then curves inward towards the rump. Step 8: Finally, draw another front leg in front of the first front leg. Right behind the hind leg add the second hind leg. Add a very short stubby tail to the rump. Reindeer, also known as caribou, belong to the Cervidae family of plant-eating mammals, along with mule deer, white tailed deer, moose, elk, red deer and others. Fossils of deer found in North America date back about 35 million years ago. Today reindeer can be found in Canada, Alaska, Norway, Greenland, Finland and Siberia. 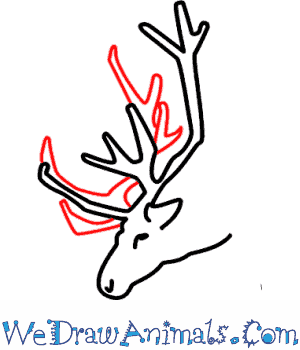 Both male and female reindeer of most populations grow antlers. 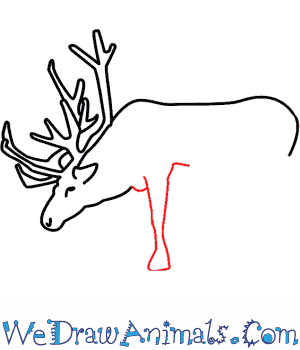 With the exception of the moose, the antlers of male reindeer are the largest among all deer. 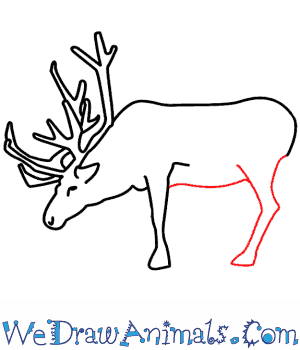 The hooves of reindeer change with the seasons. 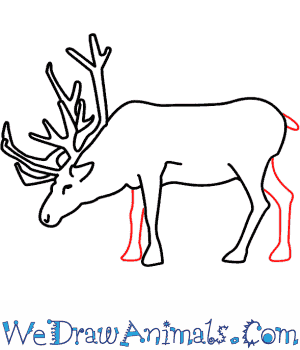 During the summer, the reindeer’s footpads soften for better traction on soft ground. During the winter, the footpads shrink to expose the edge of the hoof to cut into snow and ice. Reindeer are thought to be the only mammals able to see ultraviolet light. Male reindeer will battle with other males by locking their horns and pushing each other away. 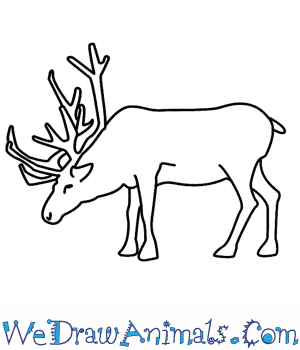 Adult reindeer have several predators including, Polar bears, brown bears and wolverines. Golden Eagles prey on baby reindeer. 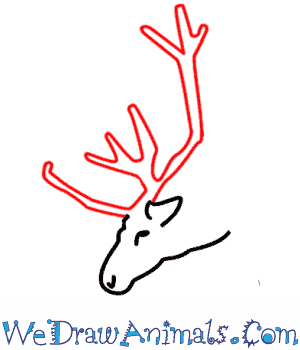 In Scandinavian countries, reindeer are ridden and reindeer meat is popular. The most popular fictional reindeer is Rudolph the Red Nosed Reindeer, featured in the Santa Claus tale.